BEVERLY — Walking is a commonly recommended exercise during pregnancy. 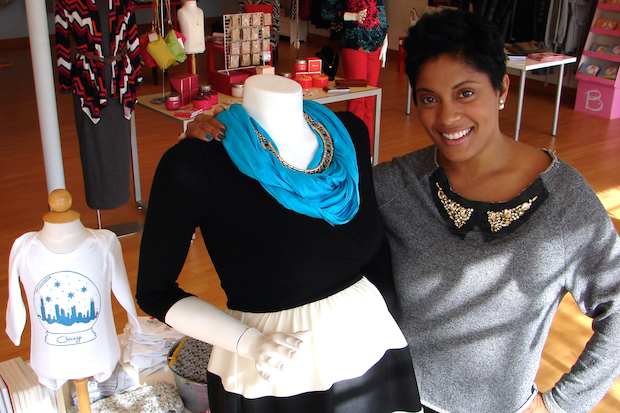 And Jamenda McCoy of Beverly hopes expecting mothers walk directly into her maternity boutique, Belle Up. Just ahead of its fifth anniversary, the popular women's clothing store is moving to 1915 W. 103rd St. in Beverly. Belle Up was born on Dec. 4, 2009, at 3440 W. 111th St. in Mount Greenwood. This 2,500-square-foot store will close on Nov. 29 and Belle Up will reopen at its new, albeit smaller, home on Dec. 4. "For us, the biggest benefit is the foot traffic," said McCoy, who also lives three blocks from her new Beverly location. Belle Up is moving to a small yet busy shopping district near the 103rd Street Metra station. Its new neighbors will include Calabria Imports, the Beverly Yoga Center, Starbucks and more. The new 1,400-square-foot store will continue to stock all the same maternity fashions as before. Belle Up added a line of non-maternity also known as its "mom's collection" in summer 2013. This line replaced some of the baby items as well as a selection of infant toys and other gift items. The move was well received. Non-maternity clothing now makes up about half of all attire at Belle Up. This split will continue within the new Beverly store, which has long been recognized for its big, red door. McCoy also works as a downtown attorney. While pregnant with her two children, she became frustrated with the dearth of South Side stores selling high-end maternity clothing. "I was always looking for clothes, and I was having to go to the North Side or order online. And who wants to order online when your body is going through that?" she said. At the urging of her husband, Joseph, McCoy set out to fill what she had identified as a need. Her store remains the only retailer selling upscale maternity clothes between 900 N. Michigan Avenue and southwest suburban Orland Park. And it's the only independently-owned maternity store for miles around, McCoy said. She credits the success of her business to the support she's received from expecting mothers living within Mount Greenwood and Beverly, along with suburban moms in Evergreen Park and Oak Lawn. And while the Mount Greenwood store has become a destination, McCoy hopes even more customers will stumble upon Belle Up at its new, walkable location. "It has been a great five years for us," McCoy said.